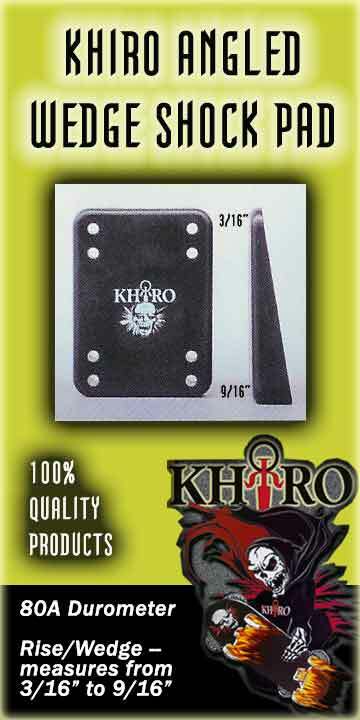 KHIRO ANGLED WEDGE SHOCK PADS-- Made from the highest grade materials -- compounded especially for KHIRO. Perfect 80A durometer absorbs shock but maintains the controlled ride you need. Great to customize the turning response of your trucks. Double them up to wedge your trucks for slalom racing setups. Old and New School hole patterns. Each wedge sold separately. About Khiro: Khiro Products are engineered and manufactured in Southern California of the highest quality materials. Khiro bushings will make your trucks more responsive, turn better, and have faster rebound with exceptional durability. Khiro bushings come in five different durometers and three different configurations for all types of skateboarding, such as street, banks, bowls, rails, gaps, transition, big vert, pipes, slalom, downhill, and or wherever your board takes you.